Nose: Quite expressive at 57.1%. Much more peat than I remember in the regular Amrut Peated CS. The peat is quite farmy and there’s some lime mixed in with it as well. There’s some vanilla as well, and the powdered ginger I always get in Amrut (would I get it blind or if I didn’t know this was young and part matured in virgin oak?). The farmy/organic peat notes get stronger with time and there’s a little bit of rubber too. With a lot more time there’s some honey and caramel under the farmy peat and more salt too. Water pushes the peat back and lets the caramel emerge along with more of the lime. Palate: Hot! And not quite as peaty as the nose. More ashy smoke here and more of a minerally quality. Some chilli pepper and cinnamon heat/brightness. On the second sip the lime pushes its way out along with some malt but it’s still too hot. This is still pretty punchy with water but now the minerally, chalky note expands and the lime and smoke are in much better balance. I could see mistaking this for a young Talisker. Finish: Long. Not much interesting development. It does get saltier as often happens with whiskies at higher strengths. With water there’s more lime on the finish and the chalky/minerally smoke hangs around longer. Comments: The nose was not initially promising but it got much better with time. The palate, on the other hand, didn’t taste very young from the get-go. Not the best Amrut I’ve had, but still pretty good. It’s probably the one that could most easily be mistaken for a Scottish malt. Much better with water. 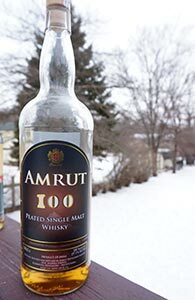 This entry was posted in -Whisky by Rating, 85-89 points, Amrut, Distillery and tagged *Whisky, Amrut, India, Peated, Single Malt. Bookmark the permalink. I’m drinking an Amrut 100 57% from you tonight. At least that’s what it says on the label. Unless you poured in some youngish Bowmore instead! Lovely nose, restrained peat, mineral (a bit of flint), wet stone, first forest flowers of the Spring (violets, snowdrops, crocus, the bunch). Faint sweet malt & grains in the background – more grains than malt, with some unobtrusive fresh wood (coconut & vanilla). The taste has a hot attack, but without the acidic burn that I’ve learned to dislike from my other Amrut experiences. It can still fool me into a Bowmore (the nice ‘naked’ type, not the sweet sherry mud OB) with discrete peat/mineral stone/wild flowers. However, here the young age is more evident, despite the balancing wood work, so to speak. The finish is lasting, though somewhat non-descript. It was interesting to compare your notes Mao with mine – we converge on the young peaty Scotch character, but you found it hotter than your other Amruts while I found it less so than what I tried. Probably worst Amrut for you, best one for me – and we may both be correct. Sounds like I should drink more Amrut and you should drink less of the same. Also, in retrospect the fresh oak is evident – I hadn’t read about that until after the review. Good stuff, this one!